If you don’t mind roach spray on your fruits and vegetables, don’t bother reviewing this list. This is the most informative resource I use when grocery shopping. 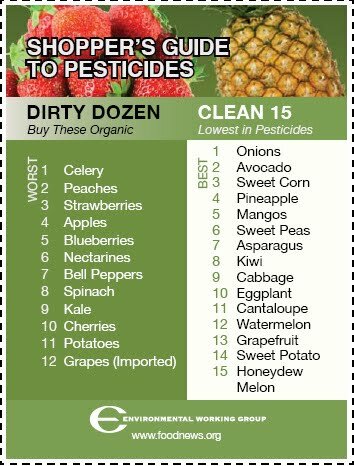 We don’t have to buy everything organic, but those on the Dirty Dozen list warrant our attention. You can find out more information by clicking here where you can also download a copy of this shopper’s guide for yourself. Note – the only objection I have to this guide is the listing of sweet corn on the Clean list. Conventionally grown corn is more than likely genetically engineered, so buying organic corn would be a safer bet.